Feed him coins and he will munch them up. 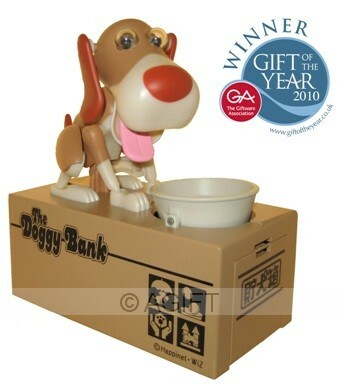 This cute dog will much away until the coins are deposited into the bank below. 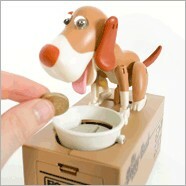 Known as "Chocken Bako" in Japan this gorgeous hungry hound is ready to munch on your change. 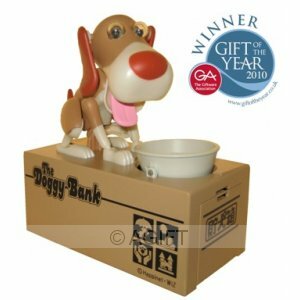 Just place your change in his feeding bowl and watch as he comes to life chomping and flapping around like a real dog until the coins are eaten (he doesn't really eat them, they drop into an easily accessible space below the dog). You won't be able to stop feeding him!